What is this nonsense about a wave of energy that is going to "hit" Earth in 2 weeks? [and from another] Many YouTube Channels, NASA and other space sources are talking about an incoming Gamma Wave due to hit Earth on December 26 2016. The last one to hit is blamed for the Indonesia quake and tsunami in 2004. Is this a false flag information event to cover up a known Nibiru adjustment or an actual additional event? The talk is that this event is much larger than the 2004 event. [and from another] https://www.nasa.gov/feature/goddard/nasas-swift-reveals-a-black-hole-bulls-eye Every couple of decades the black hole fires up in an outburst of high-energy light. Its previous eruption ended in 1989. The investigating team includes scientists from the Universities of Leicester, Southampton, and Oxford in the U.K., the University of Alberta in Canada, and the European Space Agency in Spain. The Swift X-ray image of V404 Cygni covers a patch of the sky equal to about half the apparent diameter of the full moon. This image shows the rings as they appeared on June 30. [and from another] http://www.aavso.org/aavso-alert-notice-520 June 18, 2015: V404 Cyg, an X-ray nova and a low mass X-ray binary (LMXB) with black hole component, is undergoing its first reported X-ray and optical outburst since 1989. Large scale, rapid variations are being reported in wavelengths from X-ray to radio by professional and amateur astronomers worldwide. [and from another] http://www.space.com/29835-slumbering-black-hole-burps-xray-burst.html After taking a 26-year nap, a waking black hole released a burst of X-rays that lit up astronomical observatories on June 15 — and it's still making a ruckus today. The system was caught fluctuating in visible light in 1938 and 1956, and then in X-rays in 1989. 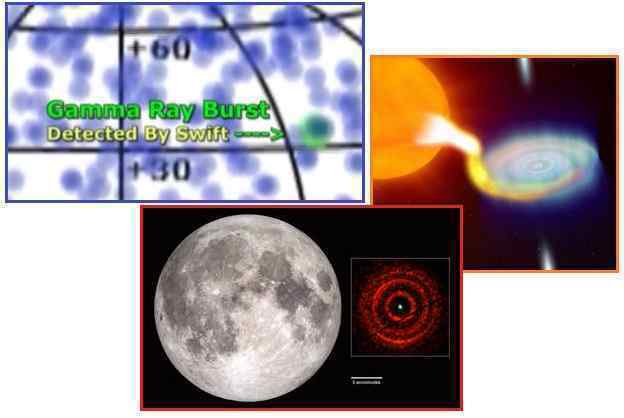 [and from another] https://www.youtube.com/watch?v=0isfkb0duN4 [and from another] https://www.youtube.com/watch?v=9jWvxoYiuxY [and from another] https://en.wikipedia.org/wiki/Gamma-ray_burst Gamma ray bursts can have harmful or destructive effects on life. Considering the universe as a whole, the safest environments for life similar to that on Earth are the lowest density regions in the outskirts of large galaxies. Our knowledge of galaxy types and their distribution suggests that life as we know it can only exist in about 10% of all galaxies. All GRBs observed to date have occurred well outside the Milky Way galaxy and have been harmless to Earth. Currently, orbiting satellites detect on average approximately one GRB per day. Earth's atmosphere is very effective at absorbing high energy electromagnetic radiation such as x-rays and gamma rays, so these types of radiation would not reach any dangerous levels at the surface during the burst event itself. The immediate effect on life on Earth from a GRB within a few parsecs would only be a short increase in ultraviolet radiation at ground level, lasting from less than a second to tens of seconds. The long term effects from a nearby burst are more dangerous. Gamma rays cause chemical reactions in the atmosphere involving oxygen and nitrogen molecules, creating first nitrogen oxide then nitrogen dioxide gas. The nitrogen oxides cause dangerous effects on three levels. First, they deplete ozone, with models showing a possible global reduction of 25-35%, with as much as 75% in certain locations, an effect that would last for years. This reduction is enough to cause a dangerously elevated UV index at the surface. Secondly, the nitrogen oxides cause photochemical smog, which darkens the sky and blocks out parts of the sunlight spectrum. This would affect photosynthesis, but models show only about a 1% reduction of the total sunlight spectrum, lasting a few years. However, the smog could potentially cause a cooling effect on Earth's climate, producing a "cosmic winter" (similar to an impact winter, but without an impact), but only if it occurs simultaneously with a global climate instability. Thirdly, the elevated nitrogen levels in the atmosphere would wash out and produce nitric acid rain. Nitric acid is toxic to a variety of organisms, including amphibian life, but models show that it cannot reach levels that would cause a serious global effect. The nitrates might in fact be of benefit to some plants. GRBs close enough to affect life in some way might occur once every five million years or so – around a thousand times since life on Earth began. Of course a Gamma Ray event did not cause the 2004 Ache earthquake, as the Gamma Rays were received long after the earthquake. Nor have such light shows caused any impact on Earth in the past. Distant Gamma Ray bursts are recorded daily by Earth satellites. They are common! The theoretical impact where such an outburst is received on the surface of the Earth is a slight increase in UV, lasting less than a second. This is hypothesized to decrease Ozone at the point of impact also, reducing sunlight received by 1% in that locale. There are also beneficial results from an increase in nitrates in rain. Looks like another one, this time in NY. [and from another] https://twitter.com/i/moments/808787824405282817 Residents of New York City were asking lots of questions as a C-130 military plane belonging to the New York Air National Guard flew around the city late Tuesday afternoon. Reports indicated that it circled midtown for about an hour before leaving the airspace. 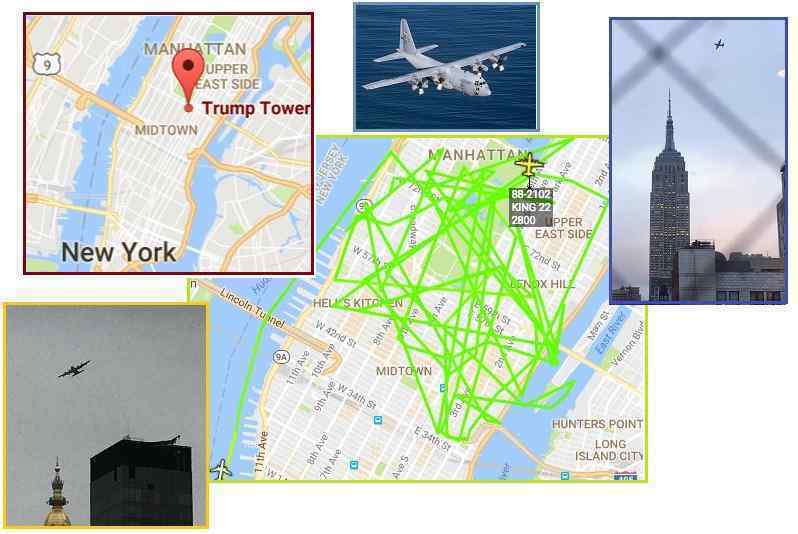 … the Air Mobility Command says they'll get back to us … I am on the 60th floor of the Empire State Building and it has circled closer than anything I have seen … Seeing multiple reports of a USAF C-130 and several Black Hawk helicopters circling low (3,000 feet) over Manhattan. No, that is not normal … The C-130 belongs to the 102nd Rescue Squadron of the New York Air National Guard. … USAF aircraft callsign “KING” listed as “SAR (search and rescue) aircraft not on mission. … I'm willing to bet it was a training exercise on what they'd need to do to scoop POTUS from NYC. [and from another] http://www.businessinsider.com/military-plane-manhattan-2016-12 A spokesman for the FAA told Business Insider in a statement that the C-130 spotted overhead was “conducting authorized flights over New York City in coordination with FAA air traffic control.” [and from another] https://en.wikipedia.org/wiki/Lockheed_C-130_Hercules Capable of using unprepared runways for takeoffs and landings, the C-130 was originally designed as a troop, medevac, and cargo transport aircraft. The versatile airframe has found uses in a variety of other roles, including as a gunship (AC-130), for airborne assault, search and rescue, scientific research support, weather reconnaissance, aerial refueling, maritime patrol, and aerial firefighting. It is now the main tactical airlifter for many military forces worldwide. 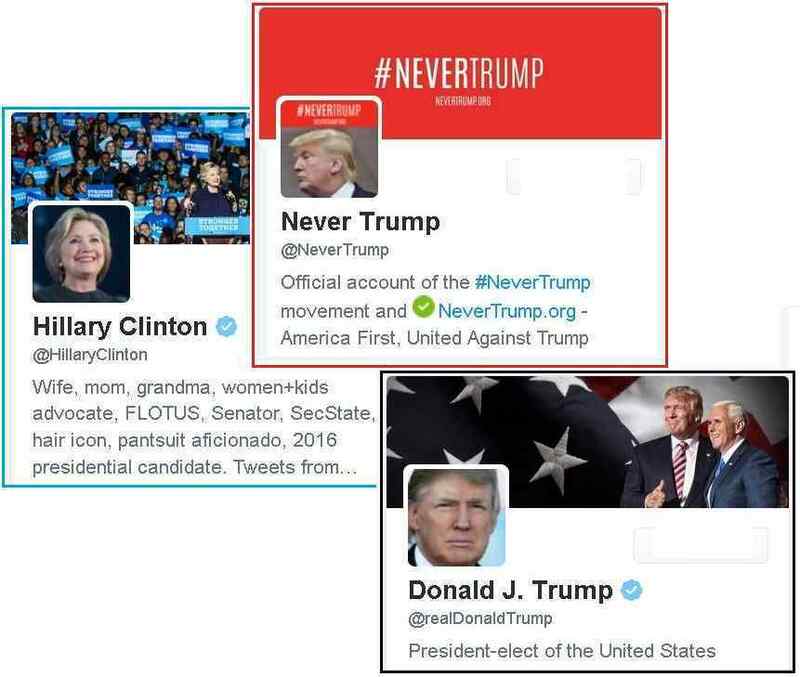 This was not standard surveillance. Helicopters are more mobile, and can drop lower than a C-130. This C-130 was loaded with special equipment to do electronic surveillance, ie chatter done by would-be terrorists. It is not just chatter, and the source of the chatter, that can be located, but also any radioactive material. Yes, this is related to protecting the President Elect – Trump – at home in Trump Towers. The Secret Service and Department of Defense will be relieved to see Trump move to more defensible residences, like the White House.